“Alexa, make some new products.” OK, maybe it didn’t happen quite like that. 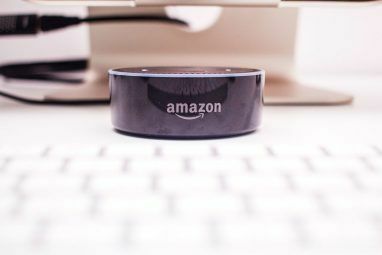 But Amazon, always full of surprises, recently debuted a new lineup of Alexa-compatible gadgets including refreshes of its Amazon Echo lineup (our comparison of Amazon Echo devices A Comparison Guide to Amazon Echo Devices: Which One Is Best for You? A Comparison Guide to Amazon Echo Devices: Which One Is Best for You? Which Amazon Echo device is right for you? We compare the Plus, Dot, Tap, Show, Spot, Look, and Fire TV Cube to help you make up your mind. Read More ). The first thing you’ll notice about the new Echo Dot is its aesthetic. Rather than the plastic housing, it’s replaced by a fabric shell as on the standard Echo. Audio also benefits from an upgrade with a 1.6-inch driver which Amazon reports as being 70 percent louder than the previous generation model. Thankfully, Bluetooth and a 3.5mm out jack remain. I’ve got an Echo Dot in my kitchen/living area, and it’s one of my favorite smart home gadgets. If you’re in the market for an Echo unit, consider the new Echo Dot. 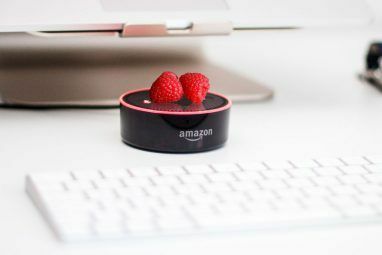 In fact, some people believe the Echo Dot is a better purchase Amazon Echo Dot vs. Echo: Why the Dot Is a Better Buy Amazon Echo Dot vs. Echo: Why the Dot Is a Better Buy There are a lot of smart speakers out there, but the tiny black or white Amazon Echo Dot is the only smart speaker you’ll ever need. Read More than a full-sized Echo. With the Echo Show (read our review Seeing Is Believing: The Amazon Echo Show Review Seeing Is Believing: The Amazon Echo Show Review Does a voice assistant speaker really need a touchscreen? The $230 Amazon Echo Show certainly makes a compelling case, with video flash briefing skills, song lyrics, and on-demand streaming of supported security cameras. Read More ), Amazon introduced an Alexa-enabled device with a built-in screen. 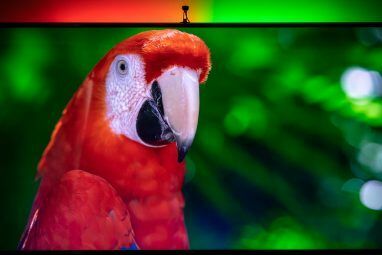 The second-generation Echo Show increases screen real estate to 10 inches. Additionally, there’s better sound quality and listening capabilites. The new Echo Show sports a whopping eight microphone array. Cord cutting is on the rise, as evidenced by the prevalence of streaming devices such as the Amazon Fire TV Stick, Fire TV (read our review Amazon Fire TV 2017 Review: The Little Box That Thought It Could Amazon Fire TV 2017 Review: The Little Box That Thought It Could The new Fire TV is the latest device vying to be plugged into your HDMI port. It's an obvious choice if you're a Prime member or already invested in the Echo line. Read More ), and Fire TV Cube. Amazon continues catering to cord cutters with the Fire TV Recast. This over-the-air (OTA) DVR features 500GB of storage space. Aside from the Fire TV Recast, you’ll need an OTA antenna and Fire TV streaming device or Echo Show. For cord cutters seeking free OTA channels, the Fire TV Recast is a solid option. 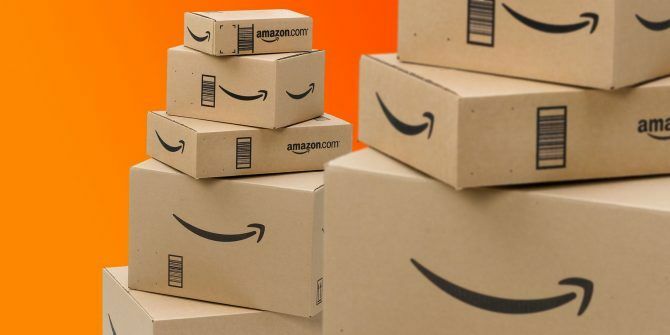 Overall, Amazon has delivered a slew of updates to its existing lineup of gadgets, while adding several new products. While the AmazonBasics Microwave might not be an essential item, the trend is clear: Amazon is seeking to continue providing smart home technologies, and even delve deeper into cord cutting. After you pick up one of these devices, check out these creative uses for your new Amazon Echo 7 Creative Uses for Amazon Echo and Alexa 7 Creative Uses for Amazon Echo and Alexa You’ve seen the ads starring Alec Baldwin, but you're still not sure what Amazon Echo does or whether you need one in your home. We’re about to find out. Read More . I'm not really sure why the Echo Sub is a thing. I'm sure that two Echos and a Sub make a decent 2.1 set, but why pay $250-ish for what amounts to home decor vs. the cost of a functional set of mid-range amplified speakers from, say Edifier, Mackie or Klipsch? On a related note, the Echo Input does what, exactly? It's $5 cheaper than a Dot. All my Dots are hooked up to speakers, but from a flexibility standpoint, I do appreciate that I can use them without. The Input needs to be a bit cheaper to be more attractive. The current Echo Show DOES need better speakers. It does seem to have the best microphone pickup of any of the current products, but the biggest problem with it is the utter lack of interesting content for the screen! I use mine nearly every day as a video phone but I can't even guess when the last time I asked it to display anything else. It's just a passive display that has my calendar and occasionally displays a news headline or something. Amazon NEEDS Youtube on that thing. Fix that, jerks. The Amazon Smart Plug is mildly overpriced. $25 can get a 3-port indoor/outdoor Alexa-enabled Smart Plug from another company. Conversely, the Echo Auto is far cheaper than third party products like the Roav Viva. Those are easily in the stocking stuffer category and, if they keep people from screwing with Youtube while they drive, might legitimately make the roads a little safer, too. Echo Toilette? "You should drink more water; your urine is rather pungent. "